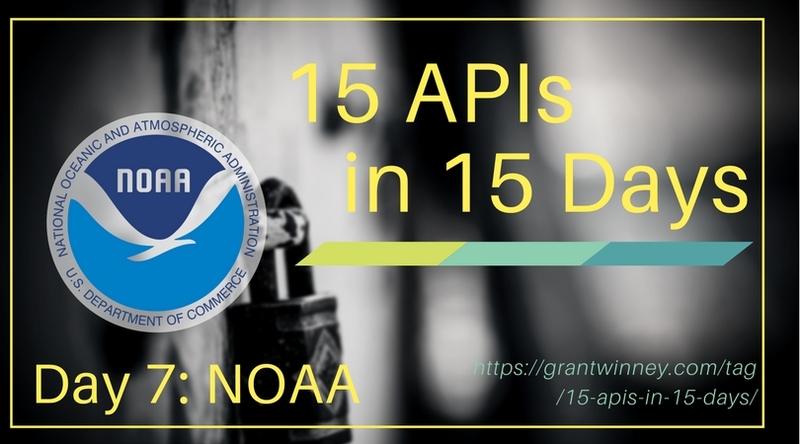 Continuing my search for 15 APIs in 15 Days (also on GitHub), I came across the NOAA API. NOAA is an American agency that studies and charts various conditions in the oceans and atmosphere. First things first... we need an access token. 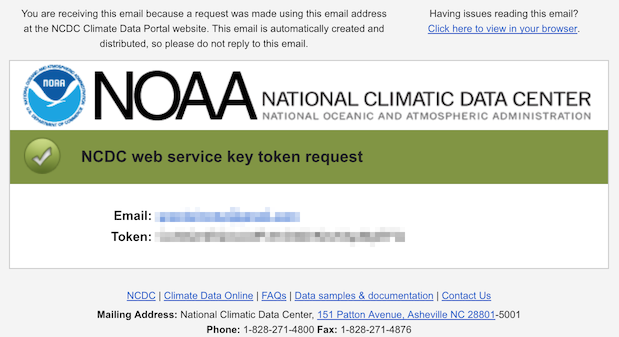 NOAA uses a slightly differently method than the other ones I've seen so far, but it's minor. You need to provide an email address and they'll email you a unique token. You can request an API token here. I got the email within seconds. The limits are very generous if you're using it for a small project for yourself or a team - "each token will be limited to five requests per second and 10,000 requests per day". For any request you make, include the access token as a header named "token". Their web services documentation is pretty straight-forward. It follows a simple format, and each endpoint you can hit is in a tab along the top of that page. You'll get the first 25 results. Check out the metadata section that tells you the offset, the number of records returned (limit), and the total records (count). You can adjust the results using "offset" and "limit" parameters. There are certain filters that can be applied. You can limit stations to a certain geographical location using a FIPS (Federal Information Processing System) code. I don't know if there's a central source for these codes, but here are some. Here are the results. Not sure what the dates mean. Once you've got a list of stations, you can get data for a station. But what set of data do you want? In order to determine that, you'll need to query to see what datasets are available. I selected the last one from the results of the previous query. At first glance, it appears I can choose from daily, monthly, and yearly summaries. You've got a station you're interested in, and the dataset for that station, so all that's left is querying for the actual data. Unfortunately, I have no clue what the returned data means. Oh well, let's get the data first, then try figuring out what it means. This request gets the daily summary for the same station we looked up previously. I limited it to the month of January because trying to get the entire year didn't finish after waiting several minutes. The above is just a portion of the results. The "station" is the one I specified, and the "date" falls within the range I specified. The "datatype" is a code that indicates what the record refers to. I'm guessing that "value" is self-explanatory - like 279 for SNWD is 279mm or about 11" of snow; and 6 for TOBS means .6°C, or about 33°F. The "attributes" though - not sure what those mean. Here's one last one - same station as before, but using the "yearly" dataset filtered to about a 7 year period. The results contain different codes than before, but I couldn't find definitions for them this time... so I'm not even sure what to make of this but here it is anyway. Emailing an API token, with no apparent way to reset it (maybe there is and I didn't see it), is a little like emailing a password. It wouldn't be my first choice. I wish they did like many other APIs and either let you generate it through the secure website itself, or make a separate API call to return the token. Each of the endpoints has some examples you can try online without an API token, which is nice for verifying they work, but it's an incredibly limited tool since you can't modify them through the website itself. I wish there were more detail about what the codes in the results mean. When it got to the point of returning data, there are a lot of codes and numbers that don't seem to be defined at all. Maybe this is only meant to be used by someone with a meteorological background? I'd love to use this in a project, maybe on the Raspberry Pi. I was thinking maybe query the station closest to my house and have a simple LED light up depending on the weather - green for rain, white for snow, blue for sleet, unlit if no precipitation. It seems like it'd take more research though.